This article is about the American actor. For the album, see Jeff Bridges (album). For the Colorado politician, see Jeff Bridges (politician). Jeffrey Leon Bridges (born December 4, 1949) is an American actor, singer, and producer. He comes from a prominent acting family and appeared on the television series Sea Hunt (1958–60), with his father, Lloyd Bridges and brother, Beau Bridges. He won the Academy Award for Best Actor for his role as Otis "Bad" Blake in the 2009 film Crazy Heart, and earned Academy Award nominations for his roles in The Last Picture Show (1971), Thunderbolt and Lightfoot (1974), Starman (1984), The Contender (2000), True Grit (2010), and Hell or High Water (2016). His other films include Tron (1982), Jagged Edge (1985), The Fabulous Baker Boys (1989), The Fisher King (1991), Fearless (1993), The Big Lebowski (1998), Seabiscuit (2003), Iron Man (2008), Tron: Legacy (2010), and The Giver (2014). Jeffrey Leon Bridges was born on December 4, 1949, in Los Angeles, California. He is the son of actor Lloyd Bridges (1913–1998) and actress and writer Dorothy Bridges (née Simpson; 1915–2009). His older brother Beau Bridges is also an actor. He has a younger sister Lucinda, and had another brother named Garrett who died of sudden infant death syndrome in 1948. His maternal grandfather was an immigrant from Liverpool in England. Bridges and his siblings were raised in the Holmby Hills section of Los Angeles. He shared a close relationship with his brother Beau, who acted as a surrogate father when their father was working. He graduated from University High School in 1967. At age 17, he toured with his father in a stage production of Anniversary Waltz, then moved to New York City where he studied acting at the Herbert Berghof Studio. He also served seven years in the United States Coast Guard Reserve. Bridges made his first screen appearance at the age of almost two years in The Company She Keeps in 1951. In his youth, Bridges and brother Beau made occasional appearances on their father's show Sea Hunt (1958–1961) and the CBS anthology series, The Lloyd Bridges Show (1962–1963). In 1969, he played Cal Baker, a Jobs Corps crew member, in the TV series Lassie episode "Success Story". In 1971, he played the lead role Mike in the TV movie In Search of America. His first major role came in the 1971 film The Last Picture Show, for which he garnered a nomination for the Academy Award for Best Supporting Actor. He co-starred in the 1972 critically acclaimed neo-noir boxing film Fat City, directed by John Huston. In 1973 he starred as Junior Jackson in the film The Last American Hero based on the true story of NASCAR driver Junior Johnson. He was nominated again for Best Supporting Actor for his performance opposite Clint Eastwood in the 1974 film Thunderbolt and Lightfoot. In 1976, he starred as the protagonist Jack Prescott in the first remake of King Kong, opposite Jessica Lange. This film was a commercial success, earning $90 million worldwide, more than triple its $23 million budget, and also winning an Academy Award for special effects. One of his better-known roles was in the 1982 science fiction film Tron, in which he played Kevin Flynn, a video game programmer (a role he reprised in late 2010 with the sequel Tron: Legacy). The same year (1982), he also starred in Kiss Me Goodbye, an American romantic comedy film directed by Robert Mulligan that also starred Sally Field. He was nominated for the Academy Award for Best Actor in 1984, for playing the alien in Starman. He was also acclaimed for his roles in the thriller Against All Odds (1984) and the crime drama Jagged Edge (1985). His role in Fearless (1993) is thought by some critics to be one of his best performances. One critic dubbed it a masterpiece; Pauline Kael wrote that he "may be the most natural and least self-conscious screen actor that has ever lived". In 1994, he starred as Lt. Jimmy Dove in the action film Blown Away, opposite Tommy Lee Jones and Forest Whitaker. His real life father Lloyd Bridges also featured in the film, playing the uncle of Bridges' character. The film managed to recoup $30 million of its $50 million budget at the box office. It was up against another explosive-themed film, Speed, which had been released a few weeks before Bridges' film. On July 11, 1994, Bridges received a star on the Hollywood Walk of Fame for his contributions to the motion picture industry. The star is located at 7065 Hollywood Boulevard. In 1998, he starred as what is arguably his most famous role, The Dude, in the Coen brothers' film The Big Lebowski. In 2000, he received his fourth Academy Award nomination, for his role in The Contender. He also starred in the 2005 Terry Gilliam film Tideland, his second with the director (the first being 1991's The Fisher King). He shaved his trademark mane of hair to play the role of Obadiah Stane in the 2008 Marvel comic book adaptation Iron Man. In July 2008, at the San Diego Comic-Con International, he appeared in a teaser for Tron: Legacy, shot as concept footage for director Joseph Kosinski; this developed into a full 3D feature release in 2010. 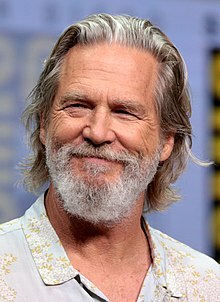 Bridges is one of the youngest actors ever to be nominated for an Academy Award (1972, age 22, Best Supporting Actor, The Last Picture Show), and one of the oldest ever to win (winning the Best Actor in 2010 at age 60 for Crazy Heart). Crazy Heart also won him the Golden Globe for Best Actor in a Drama, and the Screen Actors Guild Award for Outstanding Performance by a Male Actor in a Leading Role. Bridges received his sixth Academy Award nomination for his role in True Grit, a collaboration with the Coen brothers in which he starred alongside Matt Damon, Josh Brolin, Barry Pepper, and Hailee Steinfeld. Both the film and Bridges' performance as Rooster Cogburn, were critically praised. Bridges lost to Colin Firth, whom he had beaten for the Oscar in the same category the previous year. In 2016, Bridges appeared in the film Hell or High Water, for which he received his seventh Academy Award nomination. Referring to his career as an actor and his passion for music, Bridges says, "I dug what an actor did, but it took me a while to feel it, to truly appreciate the craft and the preparation. Plus, I was still playing music a lot, and I guess I had a hard time choosing: was I an actor or a musician, or could I be both?" Bridges studied piano at a young age, strongly encouraged by his mother. While working on the 1980 film Heaven's Gate, he often played guitar with his co-star, singer-songwriter Kris Kristofferson, between takes. His character in Crazy Heart, Bad Blake, was later based partly on Kristofferson. He released his debut album Be Here Soon on January 1, 2000. In 2005, Bridges, known as "The Dude" in the film The Big Lebowski, showed up at a Lebowski Fest in Los Angeles singing and playing the film's theme song written by Bob Dylan, "Man in Me". On January 15, 2010, Bridges performed the song "I Don't Know" from Crazy Heart on The Tonight Show with Conan O'Brien. In the film The Contender, in which he co-starred, Bridges recorded a version of Johnny Cash's standard "Ring of Fire" with Kim Carnes that played over the pivotal opening credits. In February 2010, he was among the nearly 80 musicians to sing on the charity-single remake of We Are the World. On October 24, 2010, Bridges appeared at Neil Young's annual Bridge School Benefit concert and played a set with singer-songwriter Neko Case. On April 19, 2011, Country Music Television announced that Bridges had signed a recording contract with Blue Note Records/EMI Music Group. He worked with producer T-Bone Burnett and released his second album, Jeff Bridges, on August 16, 2011. On November 5, 2011, Bridges played Austin City Limits in support of this album. In 2015 he sang on a collaboration album with Judy Collins singing a duet of the musical tune Make Our Garden Grow. In 2015, Bridges released an ambient/spoken-word album entitled Sleeping Tapes. All proceeds from the album go directly to Bridges' charity No Kid Hungry. Bridges plays many guitars, including the Gretsch Chet Atkins Country Gentlemen Model G6122-1959. In 2015 he sang on album Strangers Again with Judy Collins singing a duet of the musical tune from Candide by Leonard Bernstein called Make Our Garden Grow. In 2013, Bridges wrote The Dude and the Zen Master with Bernie Glassman. Bridges found himself at a party with Glassman and Ram Dass and their conversation led to discussing the parallels between "The Dude" from The Big Lebowski and Zen Buddhism. The book was formed from what has been described as a "transcript of a five-day "hang" on a Montana ranch." Bridges has been an amateur photographer since high school and began taking photographs on film sets during Starman, at the suggestion of co-star Karen Allen. Since 1980, he began photographing on and off set shots with his favorite camera, a Widelux F8. He published many of these photographs online and published a book in 2003 entitled, Pictures: Photographs by Jeff Bridges. Bridges narrated the documentary Lost in La Mancha (2002), about the making of a Terry Gilliam retelling of Don Quixote, tentatively titled The Man Who Killed Don Quixote, which would have starred Johnny Depp as Sancho Panza and Jean Rochefort as the quixotic hero. Bridges had previously appeared in Gilliam's The Fisher King. Bridges also narrated the documentaries National Geographic's Lewis & Clark: Great Journey West (2002, IMAX), Discovery Channel's Raising the Mammoth (2000), and ABC's Heroes of Rock and Roll (1979). He voiced the character Big Z in the animated picture Surf's Up. He also hosted VH1's Top 100 Greatest Albums of Rock and Roll series in 2001. In the Year 2016 He narrated the Movie Dream Big. Bridges has performed TV commercial voiceover work as well, including Hyundai's 2007 "Think About It" advertising campaign as well as the Duracell advertisements in the "Trusted Everywhere" campaign. On December 18, 2010, Bridges hosted NBC's Saturday Night Live; he had hosted the show before in 1983 with his brother, Beau. With the December 18, 2010, episode, Bridges beat Sigourney Weaver's record for longest gap between hosting appearances on SNL (Weaver had a 24-year gap between her first time hosting in 1986 and her second time hosting in 2010 while Bridges had a 27-year gap between his first appearance in 1983 and his most recent one, also in 2010). Bridges married Susan Geston in 1977. They met while filming Rancho Deluxe, on a ranch where Geston was working as a waitress. They have three daughters: Isabelle Annie (born August 6, 1981), Jessica Lily "Jessie" (born June 14, 1983), Haley Roselouise (born October 17, 1985), and granddaughter Grace (born March 31, 2011) from Isabelle. Bridges has studied Buddhism. He meditates for half an hour before beginning work on a film set. He has learned Transcendental Meditation. In 1984, Bridges and other entertainment industry leaders founded the End Hunger Network aimed at encouraging, stimulating and supporting action to end childhood hunger. He supported President Obama's initiative to End Childhood Hunger by 2015. In November 2010, Bridges became spokesman for the No Kid Hungry campaign of the organization Share our Strength. Its goal is to present and undertake a state-by-state strategy to end childhood hunger in the United States by 2015. Bridges also supports environmental causes and organizations such as the Amazon Conservation Team. Bud Windom Episode: "The Ordeal of Bud Windom"
Cal Baker Episode: "Success Story"
Michael Loomis Episode: "The Girls in Their Summer Dresses and Other Stories"
Claude / Prince Episode: "Rapunzel"
Himself (host) Episode: "Beau Bridges and Jeff Bridges/Randy Newman"
Himself (host) Episode: "Jeff Bridges/Eminem and Lil Wayne"
^ "Actress Dorothy Bridges dies, Mother of Beau and Jeff Bridges was 93". Variety. February 20, 2009. Retrieved April 23, 2009. ^ "Jeff Bridges Biography (1949–)". FilmReference.com. Retrieved September 3, 2011. ^ McLellan, Dennis (February 21, 2009). "Dorothy Bridges dies at 93; 'the hub' of an acting family". Los Angeles Times. Retrieved April 23, 2009. ^ "Jeff Bridges is still the Dude". Archived from the original on September 27, 2012. ^ "Jeff Bridges Biography". thespiannet. Retrieved September 28, 2011. ^ "100 Essential Male Film Performances: Part 4 – From the Page to the Screen". ^ "Fearless — A movie masterpiece about transcendence". Archived from the original on June 30, 2006. ^ Philip French (August 6, 2006). "Here's looking back at you". The Guardian. UK. Retrieved August 16, 2010. ^ "Jeff Bridges". Hollywood Walk of Fame. Retrieved June 14, 2016. ^ "Jeff Bridges". latimes.com. Retrieved June 14, 2016. ^ Kepnes, E! Online. "Jeff Bridges Shaves Head, Talks Iron Man". E! Online. Retrieved August 10, 2014. ^ "Iron Man — Official Site". Archived from the original on January 6, 2010. ^ Bridges, Jeff (guest) (June 24, 2004). "'The Door in the Floor': Actor Jeff Bridges". USA Today. Retrieved August 6, 2011. ^ a b Gretsch Guitars: Jeff Bridges. YouTube. July 20, 2011. ^ "'We Are The World – 25 For Haiti' Artists Include Kanye West, Miley Cyrus, Justin Bieber". ^ "CMT : News : Jeff Bridges signs to Blue Note Records". Country Music Television. Retrieved April 19, 2011. ^ "Video: Miranda Lambert / Jeff Bridges Watch Austin City Limits Online PBS Video". Retrieved May 13, 2012. ^ "Jeff Bridges-Sleeping tapes". www.dreamingwithjeff.com. Retrieved February 1, 2015. ^ "Jeff Bridges Lulls Listeners to Bed With New Album 'Sleeping Tapes'". Rolling Stone. January 28, 2015. Retrieved April 3, 2015. ^ "Jeff Bridges On Zen Buddhism And 'The Big Lebowski'". On Point. January 8, 2013. Retrieved April 3, 2015. ^ "Jeff Bridges On The Zen Message In 'The Big Lebowski'". The Huffington Post. February 2, 2015. Retrieved April 3, 2015. ^ Oppenheimer, Mark (January 6, 2013). "If Lebowski Calls, Will You Be in? Or Out Bowling?". The New York Times. Retrieved April 3, 2015. ^ "Photography". JeffBridges.com. Retrieved August 16, 2010. ^ Bridges, Jeff (September 1, 2004). Pictures Jeff Bridges. New York, N.Y.: powerHouse Books. ISBN 1-57687-177-0. OCLC 55227934. ^ "Pictures: Photographs by Jeff Bridges : Sam Elliott and Jeff Bridges - "The Stranger" and "The Dude" - The Big Lebowski (1998)". FILE Magazine. 2004. Archived from the original on October 30, 2004. Retrieved August 12, 2017. ^ "Oscars: Hyundai debuts clever Academy Awards ad with Jeff Bridges' actor friends". Theweeklydriver.com. March 6, 2010. Archived from the original on April 12, 2010. Retrieved August 16, 2010. ^ Samaniego, Danielle. "Name That Voice: Ten Celebrity Commercial Voice-Overs". Divinecaroline.com. Archived from the original on March 11, 2010. Retrieved August 16, 2010. ^ "Jeff Bridges Unbelievable Love Story—and the Photo to Prove It". oprah.com. Retrieved August 13, 2017. ^ Dana, Rebecca (March 10, 2010). "A True Hollywood Love Story". The Daily Beast. Retrieved August 13, 2017. ^ Rasmussen, Randy. "Rasmussen: About my cousin, Susan". rapidcityjournal.com. Retrieved August 13, 2017. ^ "Jeff Bridges bought and lives inside a crazy set from one of his old movies". businessinsider.com. Retrieved August 13, 2017. ^ D'AMBROSIO, BRIAN. "Jeff Bridges talks Montana ties ahead of Missoula concert". missoulian.com. Retrieved August 13, 2017. ^ "THR Cover: Jeff Bridges' Revealing New Interview". hollywoodreporter.com. Retrieved August 13, 2017. ^ "Photo Captures Jeff Bridges' Fateful First Meeting With His True Love". December 7, 2015. Retrieved August 13, 2017 – via Huff Post. ^ "Jeff Bridges: On Marriage". Reader's Digest. February 2006. Archived from the original on September 6, 2008. Retrieved September 9, 2008. ^ "Betty White, Jeff Bridges scoop up Britannia Awards". latimes.com. November 5, 2010. Retrieved August 13, 2017. ^ "Happy Birthday, Jeff Bridges! You're 61 Today, December 4!". Hollywood Life. December 4, 2010. Retrieved August 13, 2017. ^ Butler, Katy (Fall 2010). "The Natural – How Jeff Bridges works with anxiety and maintaining a joyful mind". Tricycle: The Buddhist Review. 20 (1): 54. ^ "Jeff Bridges". NNDB. Retrieved September 23, 2014. ^ "Jeff Bridges: Charity Work & Causes". Look to the Stars. Retrieved August 13, 2017. ^ "End Hunger". JeffBridges.com. Retrieved August 13, 2017. ^ "Jeff Bridges to Launch Campaign Against Childhood Hunger in National Press Club Address". PRNewswire. November 5, 2010. Retrieved November 6, 2010. ^ "Video: Why Does Jeff Bridges Support the Amazon Conservation Team?". Retrieved October 27, 2014. ^ "Why does Jeff Bridges support the Amazon Conservation Team?". Amazon Conservation Team. Retrieved August 13, 2017. ^ a b "Chart News August 24: Country Dominates as Luke Bryan Still Top Dawg". Roughstock. Archived from the original on November 4, 2011. Retrieved August 24, 2011. ^ a b "Chart listing for Jeff Bridges". Billboard. Prometheus Global Media. Retrieved August 25, 2011. Wikimedia Commons has media related to Jeff Bridges.